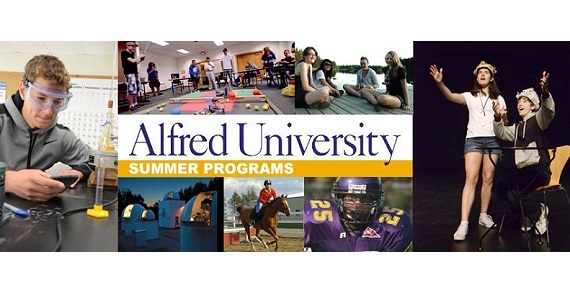 Come to Alfred University this summer for a fun-filled, exciting experience on a college campus! Alfred University offers in-depth instruction in a variety of high school institutes such as Art, Astronomy, Ceramic & Glass Engineering, Chemistry, Computer, Creative Writing, Equine Business, Robotics and Theatre as well as English and Western Equestrian and Swimming. These are week-long residential camps. The campus is located in a peaceful village in Western New York State, surrounded by rolling hills and beautiful meadows and valleys. Campers stay in Alfred University residence halls and all-you-can-eat, cafeteria-style meals are served in the University dining hall. With Alfred University's excellence in teaching and quality programming, this is the perfect place to spend an enjoyable week learning more about a favorite subject or sport with other students who share your interests, making friends and experiencing life on a college campus.